I look the different messages posted, some people are not happy. What are you looking for guys? For the price, it is a good place. We came on Phangan 7 times so you can trust us. The place is very nice, the food is good (quantity and quality). The view is amazing. The resort is very quiet. Bungalows are ok, and yes, they don't clean the room every day but it's not a 5 stars hotel. The pool is ok and usable whenever you want. You can catch the wifi in the restaurant but even in the bungalows (depending on which ones). And you will enjoy Sua, the funny dog. 7 days an no one came to clean the rooms. When I asked the answer was: "We are not a five star Hotel". Any idea how a towel might look after a week? We agreed that the Boss should drive us to Thongsala for the night market. When we apperead to the agreed time he was not there and told via phone that he was alredy without us in Thongsala. While I complained about it he hang of the phone. I booked a tour which we had to cancell due to illness on a short notice. The Boss tryed to cheat me with my Money. No words for this. Staff does not speak english what makes it difficult. Pool water is in bad condition. Pool area is dirty, sunlounger were old and totally destroyed, store room on the pool for cleaning equpement had no door and inside it look totally dirty and was full of rubbish. At any order things were forgotten or did came double because of the non english speaking staff. An employee hang around a Kind of bar all day Long where the Music is placed. Behind the bar everything was totally rotten and dirty. The Resort is on the way to get demolished. Nobody takes care of maintenance. When customer chgeck out the Bungalow e´ven if they wer next to used ones stay with all rubbish on the balkony for days as Long as new customers come in new. Food can be ok on one day and if you order the same next day it can be horrible. Our Feeling was that the Management has not understand that they have deliver a certain Standard. It is not for interest for them. We cannot recomment the Resort although it has a potential with the site and the General architecture. Sad t osee this. Not to recoomend. I've been traveling through SE Asia and using Agoda for the last 5 years and I always give honest reviews. So here it goes: First thing we were told by owner at check-in was that he acquired the hotel 2 monts ago and that he didn't have our reservation. He was FULL, he told us, for new years eve. It was our problem. No bungalow for us. Had to call Agoda service center (which was very professionnal), they call them. And suddenly, a bungalow appeared for us. A small bungalow (no place for 2 luggages). There were holes in the sticky sheets and they had what seemed like blood stains. The mattress was the without a doubt the worst I've ever sleep on. The springs were crushing our spines. The room was not done once during our 6 days stay. Staff smoked weed all day in the dining area (which I don't have any problem with) but they seemed more occupied rolling there joints than giving service. Service was slow. Food was ok when they had what we wanted (first time in Thailand I couldn't order a Pad Thai or a Burger). 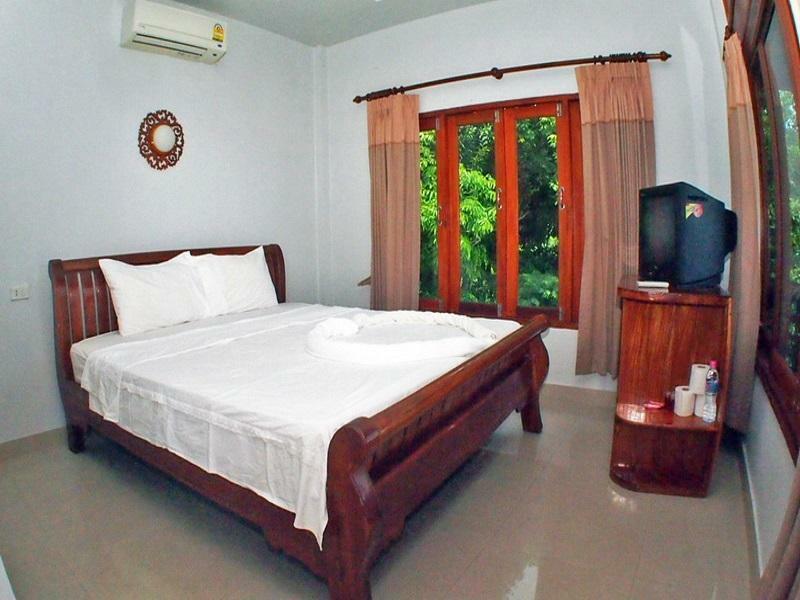 The hotel is well situated, 5 min from the Haad Yao beach. Pool is very nice. You can get waaayyy better for your money. The only good thing was the view and how quiet and peaceful it was. The customer service is non-existent. I stayed at the place for 3 nights, and did not have our room made up once. The staff are hard to come about. The room was lacking a duvet, and the nights were quite cold, there was no shower curtain and the room was not cleaned properly. Staff were unprofessional when you could actually reach them, although very friendly. I would not stay in that accommodation again, nor would I recommend it. Clean room, balcony with hammock, ocean view! Amazing stay at this hotel, very clean, brilliant views. 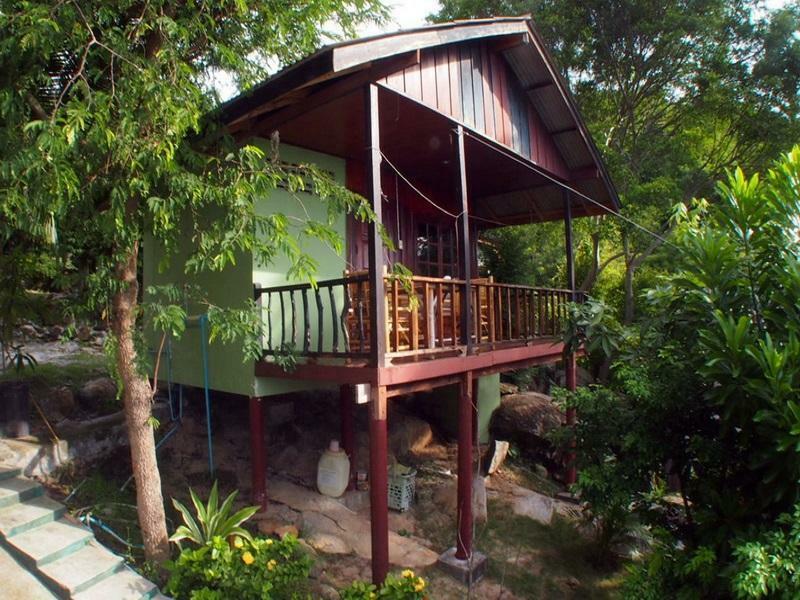 An amazing place to stay for the full moon as it is about 20 minutes away from haad rin. The resort staff was divided (some were incredibly nice, young friendly guys). It is family run, the younger staff were great the older managers weren't too accommodating. 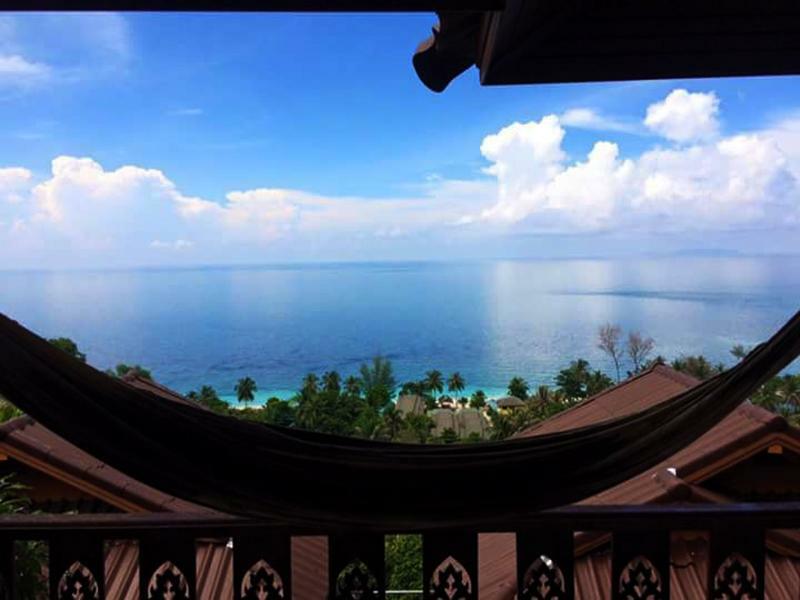 The location was VERY far away from Full moon beaches and clubs, and the minimum 5 or 7 night stay is a bit excessive as it isn't exactly a full moon party hotel. The restaurant is a bit overpriced. It doesn't have WIFI like the hotel advertises, the only place they have wifi is in the restaurant and it doesn't work very well there. When we arrived they said there sunshine bungalows were all full so they upgraded us to a seaview room which was great but it was a very steep walk up to the room. They provided taxis to the full moon party. They tried everything to keep us eating at their restaurant...really annoying when they try to control you, you don't need to take their taxi, they charge the same or more expensive than the public ones. I don't trust them. I enjoyed my stay at Haad Yao over bay hotel. The room was very beautiful with gorgeous view. It was nice to have a pool at the hotel. The service was not the best, but outside of that I enjoyed my stay there. Really nice place. I stayed for full moon party, but didn't want to be anywhere near the action. This place was great for that: haad yao is the nicest beach on the island and was quiet and relaxed the whole time. Beware, however: the hill back up from the beach is a killer and you'll find yourself covered in sweat by the time you reach your room. Plenty of restaurants, massage etc on the beach, though to save money, eat up off the beach and head down later for drinks and a fireshow. It is a fair hike from haad rin: roughly 30min by taxi, flat rate 200B (though for full moon they organised taxis for 150B). So be sure to factor this into your costs, if you plan to head to full/black/half moon. Taxis run all night for these parties. Room was beautiful. 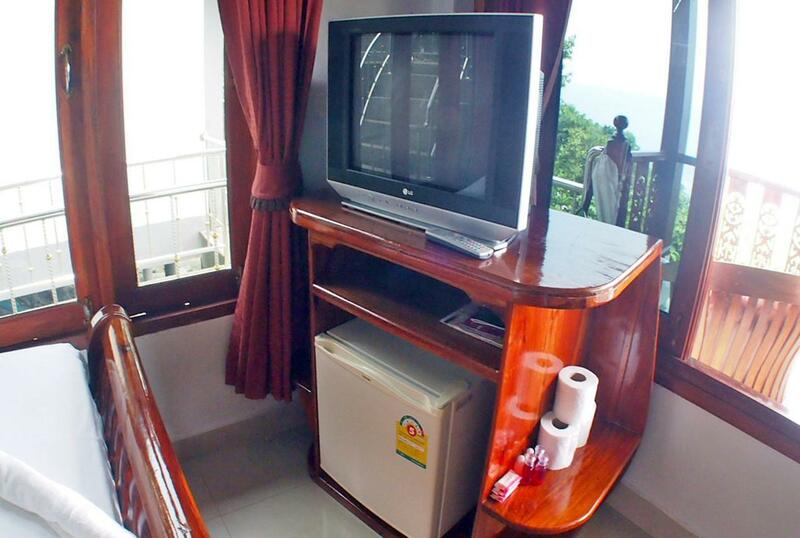 Hot shower, a/c, tv (thai channels only) and a beautiful, breezy balcony. Only hassle was that I was unable to use the safe in my room and had to move the bar fridge myself in order to plug it into an outlet. No free water, either. the rooms were clean but simple. there was also a bit of a hike up to my cabin, however the view of the sea and hillside was amazing. Estuvimos alojados 2 noches y nos sorprendió negativamente. Aunque de localización está muy bien para visitar la isla no está tan cerca de la playa como parece en las fotos de su web. Las fotografías de la web engañan muchísimo. ya que la piscina para empezar nunca la vimos iluminada de noche, los caminos para acceder a las bungalows estan muy mal pavimentados y hacen muchísima subida, y la habitación es muy precaria, sucia, con los muebles que se caen, sin ni siquiera jabones para ducharse y mal iluminada. Lo peor fue una noche que se fue la luz y nos quedamos a oscuras sin aire acondicionado pasando una calor horrible. le pedimos al servicio de hotel un cambio de habitación (ya que las habitaciones sin ac sólo con ventilador si tenian alimentación eléctrica por grupo electrógeno) y nos dijeron que no era problema del hotel sino de la copañia eléctrica, vaya que tuvimos que aguantar hasta que volvió la luz. Otro punto negativo es el servicio, el último dia íbamos a Ko Tao y pedimos al hotel que queriamos ir a primera hora de la mañana con un dia de antelación. La mujer que reponsable del hotel nos dijo que el día que íbamos (lunes) el primer ferry hasta Ko Tao salía a las 12:30 del mediodia, nos sorprendió pero lo creimos y lo pagamos. Después nos enteramos de que había varios ferris que salían antes, se lo comentamos y dijo que ella sólo trabajaba con una compañia y como ya estaba pagado perdimos medio dia que queriamos pasar visitando la siguiente isla. Por ganarse un dinero no nos aconsejó bien para nuestros intereses. No lo recomiendo para nada. Une addresse sympathique dans un cadre agreable,en pleine verdure.belle plage de l,autre cote'de la route.un peu loin de la capitale. Das Hotel schien ein top Ding zu werden, doch als wir abends nach einer langen Reise ankamen, wussten wir nicht, was auf uns zukommt. Wir hatten ein Deluxe Bungalow ganz oben! (-) der Aufstieg zum Bungalow (für einen Sportler schon eine recht gute Anstrengung) (-) spartanische Einrichtung (-) Bett (super hart und mit Sprungfedern) -> jede Sprungfeder konnte man merken - auf Nachfrage bekamen wir eine extra Decke mit den Worten, wir hätten bereits eines der besten Betten vor Ort :( (-) (-)Ameisen über Ameisen und anderen Tierchen (Tags- und nachtsüber)!!!!!! (-) die Tür und die Fenster sind undicht (ca. 2 cm Spalte) (-) Dusche (Wasserdruck eigentlich nicht vorhanden) (-) Geräuschkulisse (Vögel und Verkehr ziemlich laut) (-) wenig Abstellmöglichkeiten (-) langer Weg zum Strand (-) 7/11 (Supermarkt) ca 600 Meter entfernt -> hügeliger Marsch hin und her (+) top Aussicht von oben auf das Meer (Yao Beach) (+) weißer, feiner Sandstrand! (Einer der Favoriten an der Westküste!) (+) Klimaanlage (+) eigene Veranda mit einer Hängematte Fazit: Wer mit den negativen Aspekten umgehen kann, dann ist es bestimmt ein top Hotel. Die top Aussicht hat es für uns erträglich gemacht.